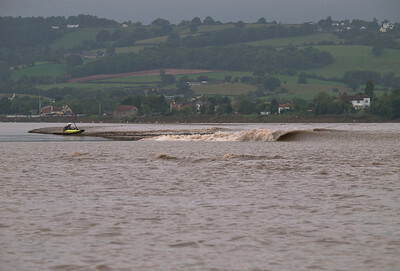 Surf giants Russell Winter, Sergio Laus & Steve King-The Severn Bore. Friday September 10 2010. 4* 10m bore. The last sizeable daytime bore of the year. This was to be a very special event for a number of reasons. Firstly it coincided with The Magnificent 7 3 day Bore festival. 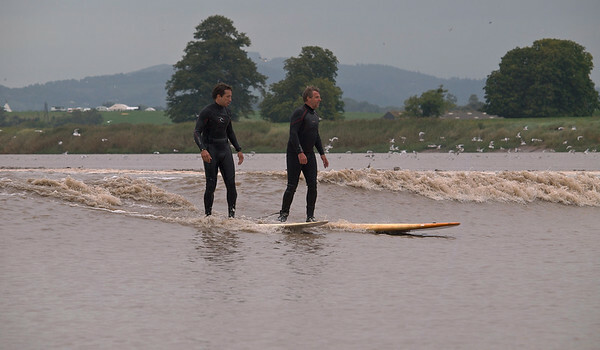 In addition, there was a very special guest who flew over to surf the famous Severn Bore. Sergio Laus set the Guinness World Record of 10.1km (6.2 miles) for distance surfing in 2005 in Brazil and then 11.8km (7.3 miles) in 2009. This would be his first time in British waters. The opportunity to shoot Sergio alongside Steve King was unmissable. Steve's 1st April 2006 equivalent long distance ride of 7.6 miles inland in just under 1 hour (speed: 8-12mph) was unofficially the world record, but as this was never 'Guinness' verified Sergio retains the title. 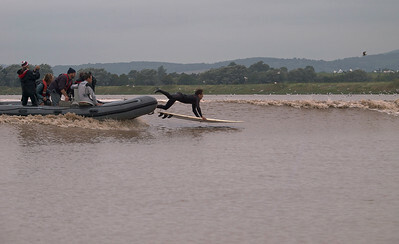 In addition, UK,s most successful pro surfer Russell Winter joined the field. 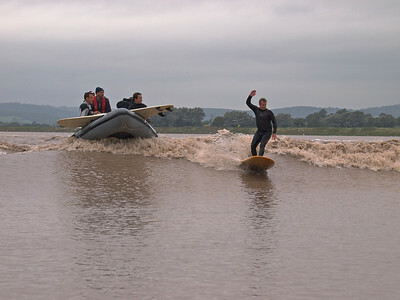 Three of the worlds surf giants on the river on this amazing day. 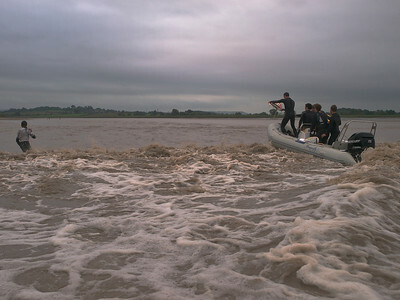 My journey and bore shoot took place in a boat. I wanted to ride and capture every moment from the lower part of the river down in Arlingham all the way to dissipation at the weir in Maisemore. All images captured with Olympus E3 & 12-60mm, 50-200mm SWD lenses. 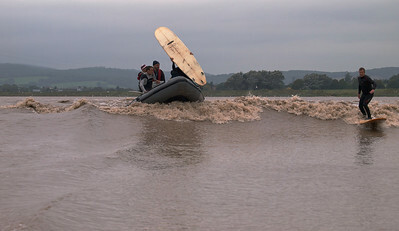 Sergio Laus (left) and Steve King riding Severn Bore. 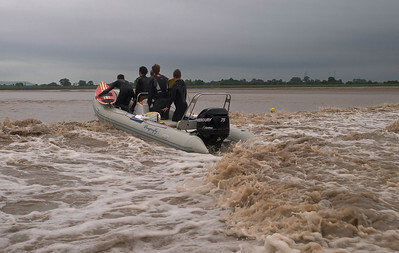 Sergio Laus launching from the RIB as he prepares to take on the Severn Bore. 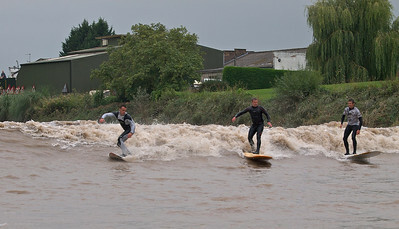 Sergio Laus (right) and Steve King working through surf. 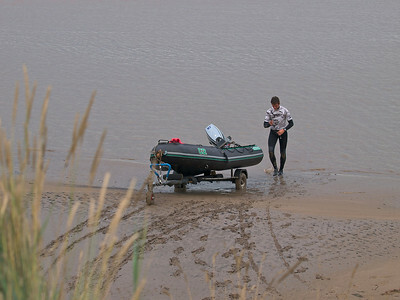 The inflatable boat preparing for launch for my photo shoot. Big thanks to Nathan (pictured) and James for hosting me. Small, cosy and perfect for accessing the entire length of the river. 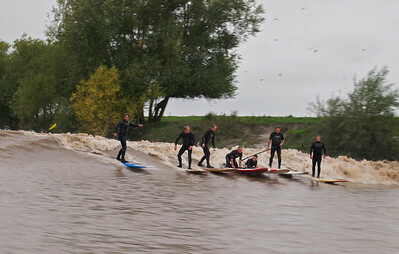 Group of surfers together on the bore wave. I reduced the aperture in order to slow down the exposure time. This gives a neat feeling of movement. Tricky to get the focusing correct with this technique mind. 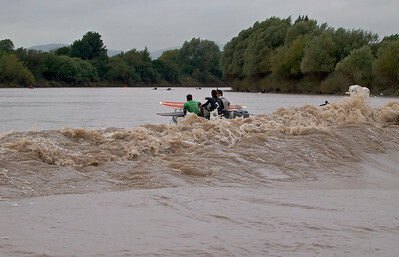 Russel Winter (left), Steve King (middle) and Nathan riding a good section of the bore wave. Love the weeping willow backdrop here. Rusell Winter (closest) with Steve King smiling and Sergio Laus (in black) looking on. Nathan capturing the moment with his surf cam. Great action shot this as the boat was riding alongside. 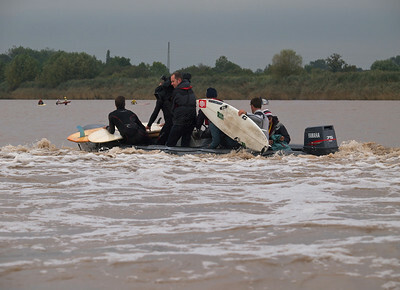 The RIB carrying the surf giants (Rusell Winter, Steve King smiling and Sergio Laus). 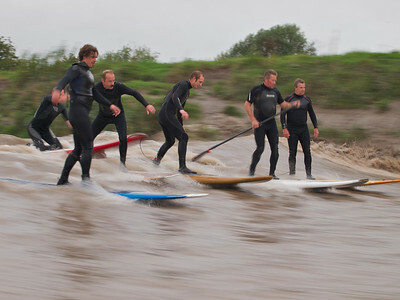 Steve & Sergio on the longboards whist Russell using the shorter trick board. 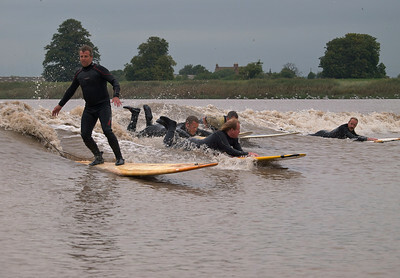 Just ahead of the wave here which makes it look like they are sinking! The bore started to really ramp up here as the wall formed. 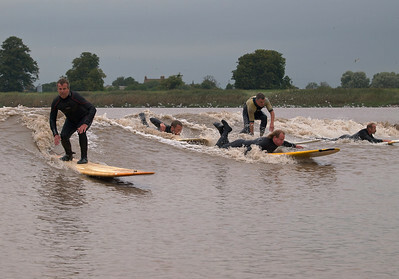 Plenty of surfers catching the ride. Steve King far right, James 2nd left. 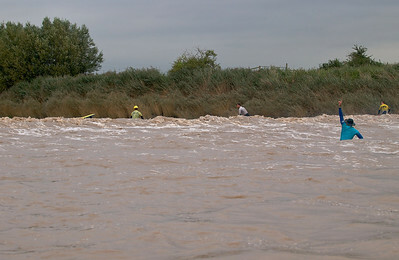 The magnificent 3 captured together riding the Severn Bore. Russell (right) up to his usual trick manoevres with Steve (far left) and Sergio (2nd from right). James joining in on the act, alongside Steve. This is what happens when you don't give Sabrina the respect she deserves. 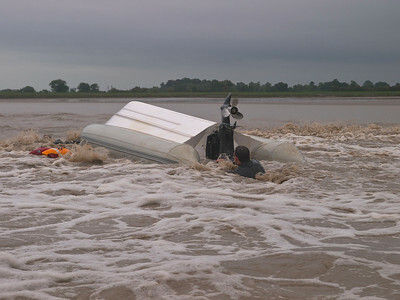 Some crazy boat handling as we watched this RIB & its 5 surfer occupants trying to turn side on along the bores leading edge, with suicidal results! A quick shout and fortunately all the guys gave us a thumbs up OK.
Steve King showing the others how its done. Nice pic of Steve this. James far right. Crocodile Dundee in the foreground watching on as Steve King's boat waits patiently for the right moment to run through the bore's leading edge. 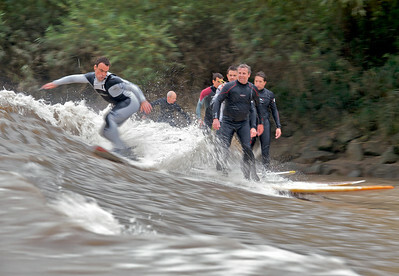 Steve King riding the wave with other surfers alongside. Great shot this. Steve King working his magic with the others contemplating joining. Left to right, Steve, Sergio and Russell all together from a distance. Reasonable bore wave along most of the river at this point. A real strong shot this. It captured the business and mood of the day. 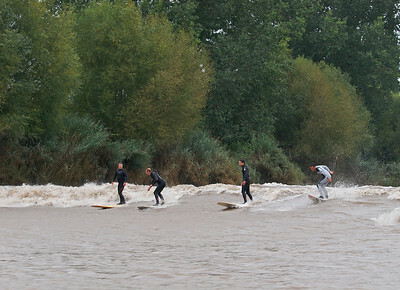 Surfers were littered everywhere along the river in wait for the bore. The ships and colour in the background amongst the wonderful greenery make a complete composition. 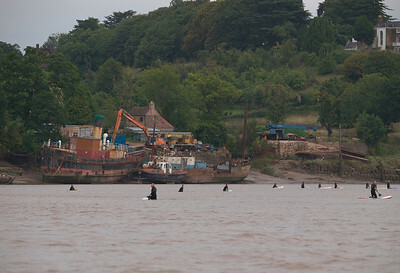 Its that Crocodile Dundee character in the tidal aftermath and his chums. 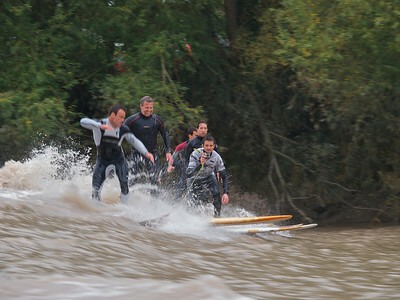 The surfers ahead are riding the wave. Great action shot this. 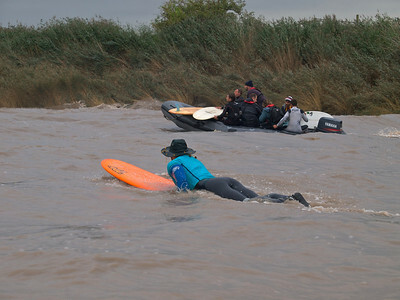 Rusell Winter up to his usual surf trickery with Steve King alongside and Sergio Laus (in black) looking on. Russell's expression makes this shot work. My hosts for the day. Big thank you to Nate (coxing here) and James (swimming out). Good depth of field here with a tad of fill flash to bring out Nate & the boat. 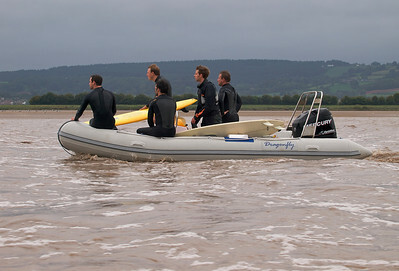 Nathan (left) riding the bore whilst the kamikaze boat load are hoping to join him. This is the first of a series piecing the RIB disaster. At this point we are behind the leading edge of the bore in a good position. That boat is riding the bore! Another boat ahead of the bore. It was a busy day on the river. I do like seeing the calm ahead of the turbulence. 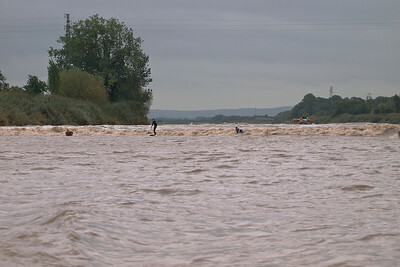 Steve King riding the bore whilst Sergio Laus on the boat is about to join him with his longboard.